Lately I’ve been trying extra hard to make desserts and breakfasts from scratch. Less processed cookies, treats and cereals = more homemade goodness. 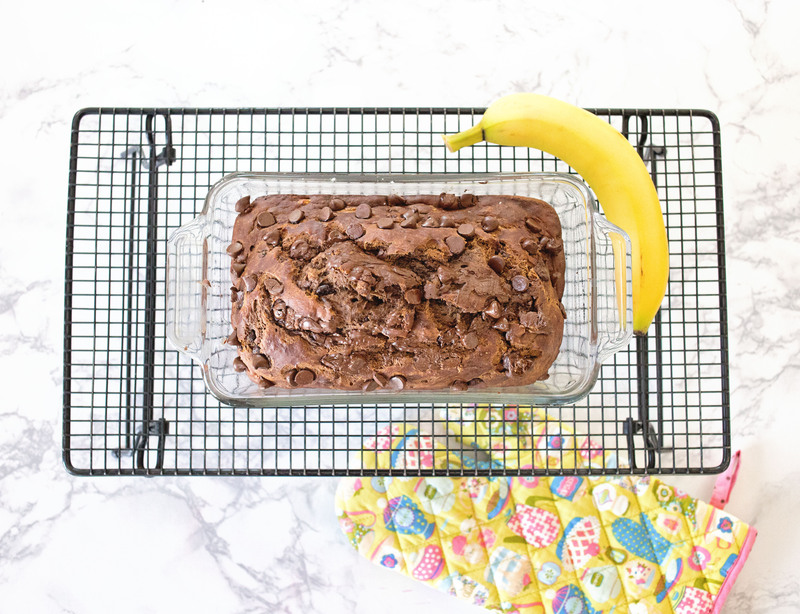 Today I’m going to share the amazing recipe we made over the weekend: Chocolate Caramel Banana Bread. Like so many, I start each day with a cup of joe. I prefer mine iced, even in the dead of winter, with a smidge of sweetener. I had just discovered an amazing chocolate caramel flavor and it was like having my favorite candy in my coffee. At least once per month I use up ripe bananas with our family’s favorite banana bread recipe. I’ve been making it for years and it turns out perfect every time. 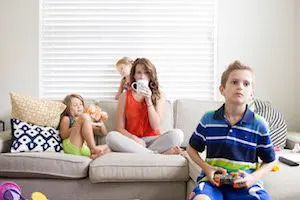 I’ll make the basic recipe and let the kids have it for breakfast, or I’ll toss a few chocolate chips in the batter for dessert. 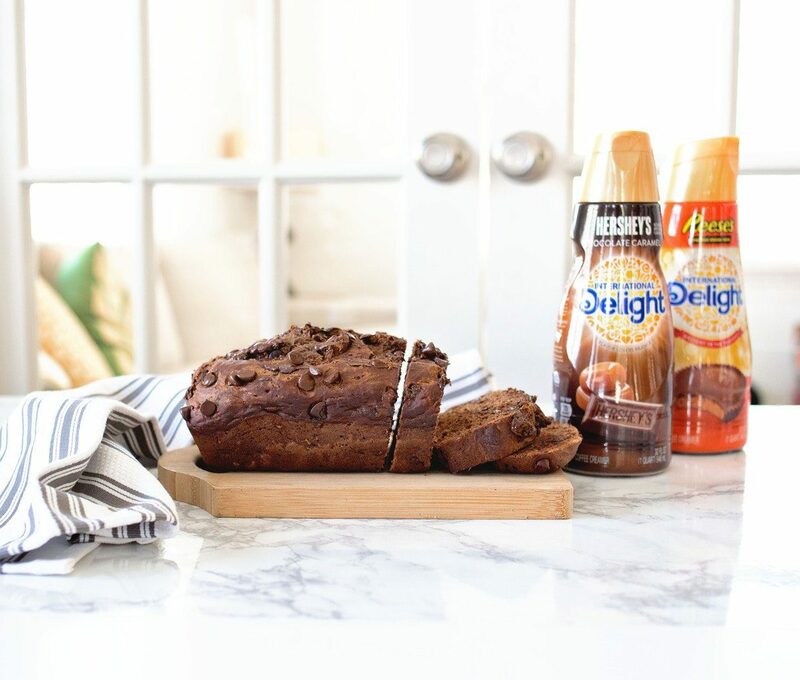 Over the weekend, I decided to see if I could turn our favorite bread into a chocolate, caramel, banana bread dream. To make this chocolate caramel goodness, start with three ripe bananas. Add an egg, sugar, margarine or butter, and the secret ingredient: International Delight® HERSHEY’S® Chocolate Caramel. This stuff is amazing! Even better, you can save on your favorite International Delight® flavors when you grab the $0.50 Ibotta coupon and recipe in your local store display. Next, add flour, cacao powder, flour and half of your chocolate chips (about 1/4 C.), if desired. Pour your batter into a bread pan or a 9×9 square pan. Wait impatiently for it to bake. Allow to cool on a cooling rack for about 20 minutes before slicing. The result? Moist, chocolatey, caramel goodness. Mmmmmm…. Disclaimer: I hate the word moist as the next person, but there just isn’t any better word to describe it! What is a good synonym? Help! If you want you could drizzle a little caramel on each slice before you serve it up. YUM. I’m glad I got photos right away, because this whole loaf was gone within 24 hours. I love that you can switch up the flavor every time with one quick ingredient swap. Can you say Chocolate Peanut Butter Banana Bread?! Just use International Delight® REESE’S® Peanut Butter Cup. How about a chocolate coconut version? Swap in some International Delight® Almond JoyTM! 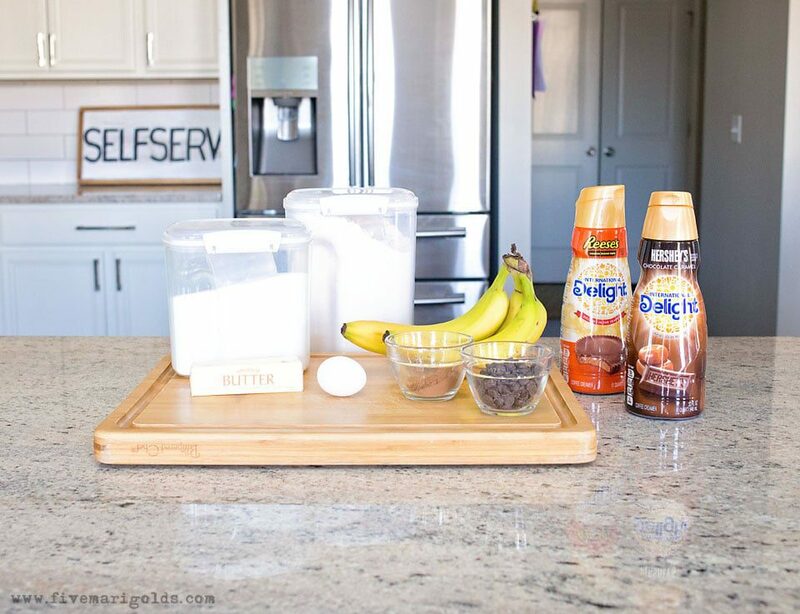 Combine bananas, sugar, margarine, creamer and egg. Add cacao powder, flower and baking soda and mix until thoroughly combine. 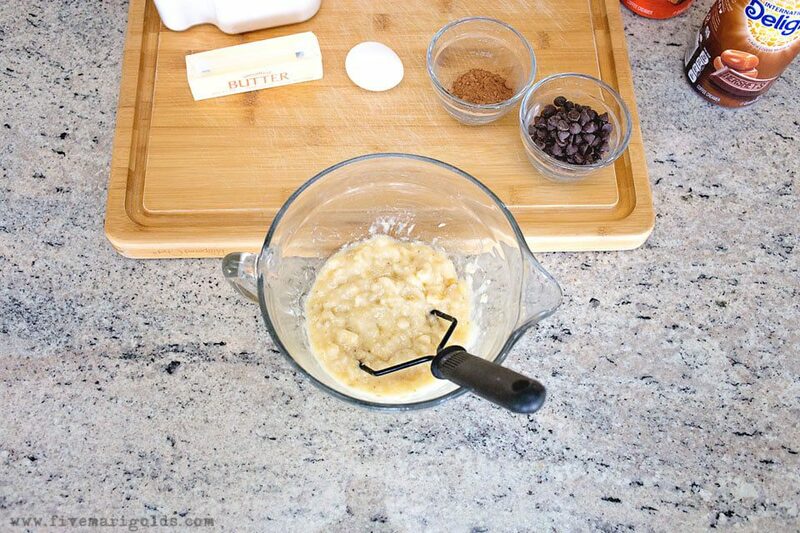 Add half of the chocolate chips, if desired. Pour into greased bread pan or 9x9" baking pan. 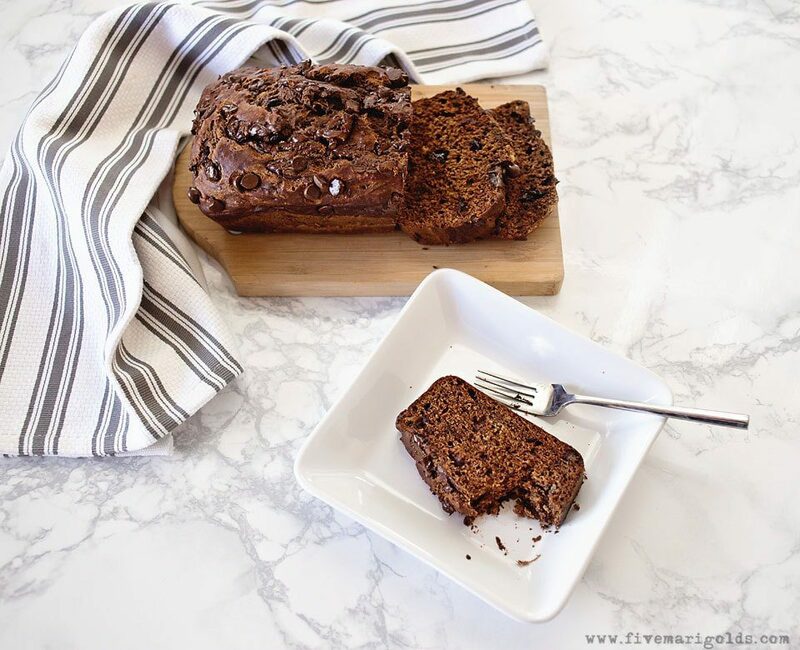 What do you think of my Chocolate Caramel Banana Bread recipe? Please tell me in the comments below! 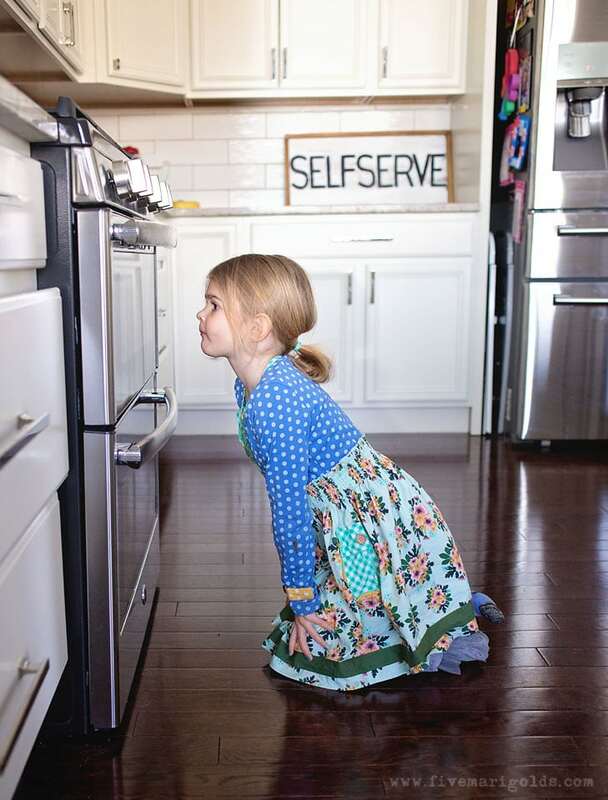 If you’re looking for more family-friendly recipe ideas, check out my favorite recipes here. 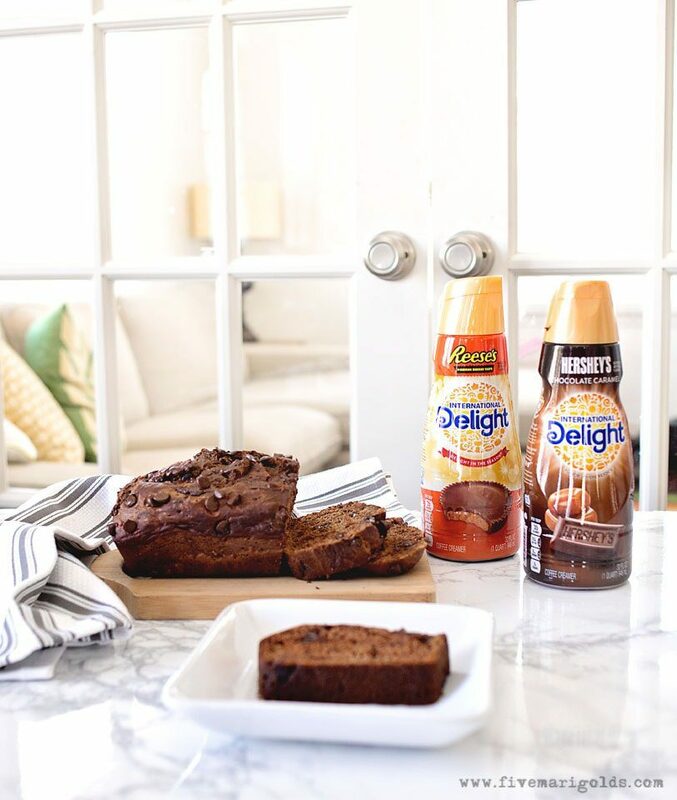 Then, visit International Delight’s Pinterest page to find more recipe inspiration for delicious, seasonal treats. You can find these flavors and more at your local Walmart. You have two temps, which is right? Do you mean 9″ square and bread loaf pan? Hi Delores – thank you for stopping by! Sorry for any confusion – you are correct: the two baking times listed depend on whether you choose to use a bread loaf pan or a 9×9″ baking pan. I usually like to bake ours in a 9×9″ pan and slice it into 16 pieces of bread to serve. I hope that helps! Would this work as well using butter instead of margarine? Absolutely, I’ve found that with this recipe I can use margarine and butter interchangeably. I mostly use butter for baking these days, but I’ve made this recipe for so many years that I kind of get stuck in my old ways of using the original ingredient of margarine!